Zots are the icons that appear over a RCI lot when the lot is not adjacent to a transportation network, the lot is not served by power or water utilities, or in the case of residential lots, there is no reasonable commute path for the occupants to get to work. The presence of a Zot over a lot is advance warning that the building on the lot is in danger of abandonment due to dilapidation. 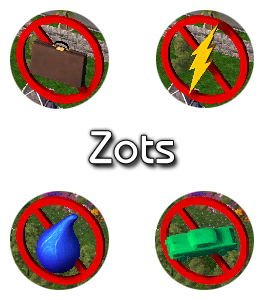 The zots can be hidden by using the cheat code "tastyzots". Use of this cheat code, however, will not eliminate the requirement. The only way to get rid of transit and commute zots is to provide the condition that is lacking (i.e: build a street or road adjacent to the lot; establish employment opportunities closer to the lot). Providing access to power and water utilities will remove those corresponding zots, or the need for these can be addressed through use of the cheat codes "fightthepower" and "howdryiam," respectively.